There are few things more annoying than discovering some of your favorite coffee beans are getting stale and taste much worse than when you first opened the bag. I experimented with various methods to keep coffee beans fresher in the last six months, and I would like to share some of my findings in the form of different options you could adopt. In short, there are four things you want to keep your coffee away from: oxygen, humidity, heat and UV light. All of those can damage coffee over time. The various tools and approaches described below are therefore designed to protect coffee from one or more of these factors. Freshly roasted coffee degases a lot of CO2 for a short amount of time. If it is quickly sealed in a bag with a one-way valve by your roaster, this will contribute to expel some of the oxygen that was initially present in the bag, therefore creating an even better protection against oxygen. When you open the bag for the first time however, all of this CO2 immediately leaves the bag and gets replaced again by the average air composition, with all its oxygen. The coffee does not have that much more CO2 to release anymore, and therefore this newly added oxygen will be free to slowly damage the coffee with oxidation. This effect becomes even more marked when the bag gets almost empty, because then you have more air (and therefore oxygen) in your bag that is free to attack a smaller amount of coffee. These considerations explain why you can get a great cup from a freshly opened bag roasted a month ago, but within just a week or so after you opened that bag, the taste will quickly degrade unless you take proper care to protect your coffee against oxygen. Generally, it’s a good idea to open the original bag only when you brew your first cup of coffee with it. You still need to keep the bag away from heat, and it’s good not to shake it too much and store it upright so as to keep its CO2 reserve intact. One of the easiest ways to quickly store coffee in a safe place is to use opaque and hermetic zip-lock bag with one-way valves such as these ones. They will protect coffee from humidity, UV light, and also from oxygen up to a point. A lot of roasters already sell their coffee in high quality bags like this, but I find it useful to have a few of them for the moments where I discover a roaster did not add a zip-lock to their bags for example (I’m looking at you with an angry face, all roasters who don’t). Just make sure that you get as much of the air out of the bag every time you close it. Bottles of inert gases (typically CO2 and nitrogen) can often be bought in wine stores for about fifteen dollars a bottle. They are a bit hard to order online, but it is worth getting a few of them as a nice addition to zip-lock bags; you can just push the oxygen out of the bag by adding a small amount of inert gases in the bag just before sealing it. Here’s how I use inert gas bottles: Put the bottle’s straw through the zip-lock, and almost close the zip-lock bag except for a small opening where the straw is. Get most air out of the bag by pressing on it with your other hand, and with your hand still pressed on the bag, give a small 1-second push of inert gases (you can make it 2 seconds if you have a very large and almost empty bag). Immediately remove the straw and close the rest of the zip-lock bag. A typical inert gas bottle will last for a bit more than a hundred uses like that. You will need to do this every time you open and close the bag however, so this is not a particularly great solution if you constantly brew coffee. In these cases, oxygen pads (more below) are a better solution. Vacuum sealers require a bit more work on your part, but in my opinion they provide one of the best ways to keep your coffee fresh, especially in the long term when combined with other methods. I had amazing coffee vac-sealed months ago with no hint of oxidation whatsoever. I only tried one vacuum sealer yet, and it turns out that it works pretty well for me. It’s probably not appropriate for industrial use, but I have been using it almost every day for more than three months and I had no issues with it. There are two annoying things about it, but I’m not sure which vacuum sealers don’t have these issues, if any. (1) The plastic bags are way too large and need to be cut, which is a bit more work than I’d like; (2) the vacuum chamber is a bit far from the edge of the sealer, so you always need to leave a bit more than an inch empty in the plastic bag. Here’s how I recommend using this sealer; take one of the unnecessarily huge plastic bags with a ruler and a pen. Make two marks on the bag at 1/3 and 2/3 of its width (excluding the sealed margins). Do this near the bottom and near the top of the bag. With the ruler, use these marks to draw a vertical line at 1/3 the width and another one at 2/3. Use scissors to cut along only one of these lines (if you cut out both right away, the rest will be more of a hassle). Use the vacuum sealer in heat-seal mode (not vac-seal) to seal both sides that you just cut out. Cut along the second line, and heat-seal both sides again. You now have three thin and long bags; those are much more useable sizes in my opinion, and they will save you plastic in the long term because you will minimize the empty portion of the that the vac sealer forces you to leave. When you fill a vacuum bag with coffee, I recommend using a relatively large funnel – just make sure the mouth will let beans through without clogging first. As I mentioned earlier, make sure you leave enough space at the top of the bag to seal it properly. I suggest marking what coffee this is and the roast and seal dates at the bottom (not the top) of the bag. The thing that is really neat with this format is that you can easily cut the bag open, weight a single dose out of it, then immediately re-seal it with your vac-sealer. Because you are freeing up more space than you are cutting out every time, you will even be left with a smaller but re-usable bag. It’s always good to leave your vac-sealed coffee bag on the counter for a dozen minutes after you vac-sealed it, especially when you use a plastic bag for the first time. This will allow you to quickly notice if you didn’t properly heat-seal one of the bags or if it was otherwise damaged, because it will become loose. There is also one thing your vac-seal bags won’t protect against: UV light. It is therefore good precaution to either store them in a dark closet or in an opaque bag. Make sure you store vac-sealed bags of coffee in a dark place, or in an opaque bag. There is one device in most people’s houses that is great at long-term preservation: freezers. Keeping coffee in the freezer has sometimes been feared by the coffee community. This is probably mostly true because careless storage in the freezer can quickly destroy your coffee. Remember that humidity is one principal enemy of your coffee; this is one that your freezer alone will not protect against. To protect your coffee against the humidity and potential odors in your freezer, you simply need to seal it carefully. This is very easy to do with vac-sealed coffee, but I recommend putting vac-sealed bags in a large plastic container, because otherwise it’s easy to poke a hole or tear a bag with the other food you store in the freezer. Cheap zip-locks or plastic containers often do not provide a good seal and are at risk of letting humidity in your bag of coffee. I suggest using slightly more expensive sturdy bags with double zip-locks, or tupperwares with a rubber gasket and clips. You can also use something like the Airscape, but I tend to prefer bags because they take up less space as you use up the coffee. But hey, maybe you don’t store 25 different coffees in your freezer like I do. There’s another subtlety in using the freezer to store your beans. When you take something cold out of the freezer and leave it in contact with air, the ambient humidity will quickly condense on its cold surface. This means your coffee beans will come in contact with water if you open a sealed bag of coffee that is still cold. This is probably not bad for a dose of coffee you’re about to use, but it is really bad for the rest of coffee you’re about to re-seal. I recommend only using the freezer for medium to long term use: when you decide to drink one of your bags of coffee, just take it out of the freezer a dozen minutes before breaking its seal, and then store it outside the freezer. If you’re motivated enough to single-dose your coffee in the freezer, you won’t have this problem as much, but vac-sealing them will be really annoying. There is a study showing that cold coffee beans shatter a bit more therefore creating slightly more fines in your grind distribution at typical freezer temperatures, so you might still want to let them thaw a little before grinding them. I read some baristas refraining from using the freezer because they were afraid that the humidity inside the coffee beans would freeze into crystals. However, I have seen Scott Rao mention that this water is trapped in cellulose cells and cannot crystallize as a consequence – I have not seen studies on this, but my taste buds informed me that coffee vac-sealed and properly stored in the freezer for more than a year still tastes great. I also read that un-freezing and re-freezing coffee is bad; I am not sure why and I never tried, but my guess would be that this is either based on bacterial build up or a gradual weakening of the cellulose cells inside the coffee. One last consideration; I read testimonies about how great ultra-low temperature freezers are for preserving coffee, but those are very expensive and I never tried it. Thanks to Matt Perger who recently shared something about this on Instagram, more recently I decided to use oxygen absorber pads instead of inert gases. They are relatively cheap, can be shipped easily, and they won’t get immediately spoiled every time you open a bag. If you would like to know more technical details on oxygen bags, I recommend reading this page. Here’s a summarized version of useful facts: (1) typical 100cc bags can be used to store up to about a pound of material; (2) it takes several hours for the pad to absorb all oxygen from your bag. Oxygen also won’t attack your coffee extremely fast, so this is good because it also means you don’t have to be in a total rush to seal your bag; (3) when the oxygen pad is completely spent, you can feel through the bag that the materials inside it will are clumpy and crystallized. If you order some of them, you’ll notice that they come vac-sealed. This should not surprise you, because they would otherwise already be spent (it surprised me for 5 seconds). When you break the package open, I recommend placing them all in a large sealed zip-lock (see above). You can then just open and close the zip-lock every time you need one. Just don’t forget the zip-lock bag open. I leave it in the original bag until I first brew it, unless I want to keep it for long term use, in which case I open it right away. When I open the bag, I transfer it to a few thin vac-sealed bags, each with one oxygen absorber at the bottom. I typically keep one of them in an opaque bag at room temperature and store the rest in a plastic tupperware in the freezer. When I want to use a coffee stored in the freezer, I just transfer it to the opaque bag at least a dozen minutes before I use it (sometimes the night before). When I want to brew coffee, I cut open a room-temperature vac-seal bag, get the dose out, and immediately seal it again. When I don’t care about a coffee as much, I simply put it in a sealed zip-lock if the original bag lacks it, and put an oxygen absorber pad in the bag. Before closing the bag, you can whisper “you should have been roasted better” in the bag. I think more roasters could include an oxygen absorber in their packaging, I’ve only seen one roaster do it (Holistik Coffee in Hungary). As you say storing them long term is tricky since they go off all at once once you open the pack, however for a roaster it would be far easier to throw one in one they’re packing all the bags. Coffee roasters often have opinions, sometimes quite strong, about when a batch reaches it’s peak for grinding and drinking. Obviously it would be ideal to reach and then lock in the coffee (through the numerous methods you mention) right at that moment. What’s your research and/or thinking about when or how to discern when a coffee ages enough to attain it’s ideal drinkability? Does it vary? What does ‘aging’ even mean in this circumstance (lot’s of oxygen at first, no oxygen, maximum CO2 release?). Thanks, I’m enjoying the way your articles slowly develop a finer way of thinking about coffee. I didn’t do any research about this, so I’m not sure. 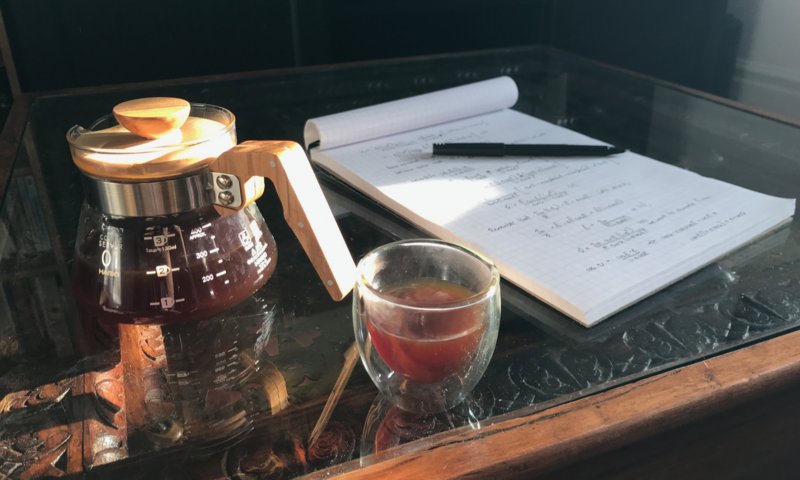 I suspect it depends on brew method: lots of CO2 probably makes it harder to make a good bloom or reach high extractions with a V60, but probably not with an immersion. This would probably only be important for darker roasts or coffee roasted only a few days ago. One other thing (if you’ve already received this I may have failed to log in correctly). As you likely know, but don’t mention in your article, Food Saver makes varying sizes of thick, strong vacuum containers that can be repeatedly vacuum sealed and then put back in the freezer. My freezer space is limited and I’m not storing 25 different coffees like you (although that “is” an interesting idea!) but I’ve used Food Saver plexiglass (?) containers for years with rarely a seal failing. Thanks ! I’m not sure if they work with my vac seal model, but the format looks better. Nice article as always Jonathan! If after my 1st brew and opening the original bag I do my 20g batches into standard 10x7cm zip-lock bags and put those into Coffeevac which I then open twice per day, does it still make sense to put 1 oxy-sorb into Coffevac? And when do you think the oxy-sorb will need replacing for now one under these circumstances? Hi Jakub, not really because your ziplocks are isolating your beans from the interstitial air inside the Coffeevac. If the ziplock seals are not perfect and you don’t often open your Coffeevac, then it’s possible it would help a bit. I would recommend to change the oxygen absorber when it feels like it crystallized to the touch. I would also love to find some small bags to make things a bit easier. The first suggestion from bytheway only works with vacuum chamber models, which are nice but usually go for over a grand. The second item looks great, too bad it ships from the UK and therefore the postage is quite expensive. I agree. I’ll let you know if I find small ones compatible with lower-end vacuum sealers. The best method I have yet is take a ruler & pen, mark then at 1/3 and 2/3 the width and use an exacto cutter + glass cutting board to cut a couple sheets at one. It’s still a pain.